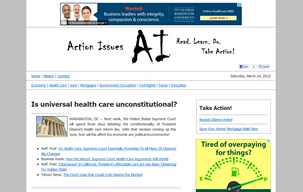 Action Issues (launched Mar. 17, 2012) Action Issues will provide information about the issues that are most important to Americans. Besides providing a variety of point of views, the website's goal is to get people to take action on these issues. Besides daily updates, Action Issues is strongly embedded with the most popular social networks, helping to filter out all the clutter of useless news items published by the major news organizations.